Fri., Sept. 7, 2018, 11:13 p.m.
Konner Kinkade threw for 183 yards and Isaiah Strong had three touchdowns and Pullman (2-0) defeated North Central (0-2) 45-13 at Joe Albi Stadium on Friday in a nonleague game. Shadle Park 16, West Valley 14: Carson Doyle rushed for 114 yards with two touchdowns and the visiting Highlanders (1-1) defeated the Eagles (1-1). Deer Park 27, St. Maries 6: Lucas Keller passed for two touchdowns and the Stags (2-0) downed the visiting Lumberjacks (2-1). Newport 34, Priest River 8: Danny Bradbury ran for 131 yards and two touchdowns and the Grizzlies (2-0) defeated the visiting Spartans (1-1). Omak 35, Lakeside (WA) 33: The Pioneers blocked a 42-yard Dillon Dennis field goal attempt as the clock expired to eke out a win over the host Eagles (0-2). Kanen Ables accounted for four of the Pioneers’ five touchdowns. Colfax 21, Freeman 14: Jacob Brown ran for 149 yards with two touchdowns and the visiting Bulldogs (1-1) defeated the Scotties (0-2). Liberty Bell 32, Kettle Falls 26: Brady Mariarty had two touchdowns and the Mountain Lions (1-1) defeated the visiting Bulldogs (0-2) in overtime. Reardan 58, Davenport 14: Alex Clark rushed for 89 yards with two touchdowns and the visiting Indians (1-1) defeated the Gorillas (1-1). Wilbur-Creston 38, Springdale 7: Ethen Tesch ran for 93 yards with three touchdowns and the visiting Wildcats (2-0) beat the Chargers (1-1). Aaron McDowell added 112 yards with a touchdown on the ground for Wilbur-Creston. 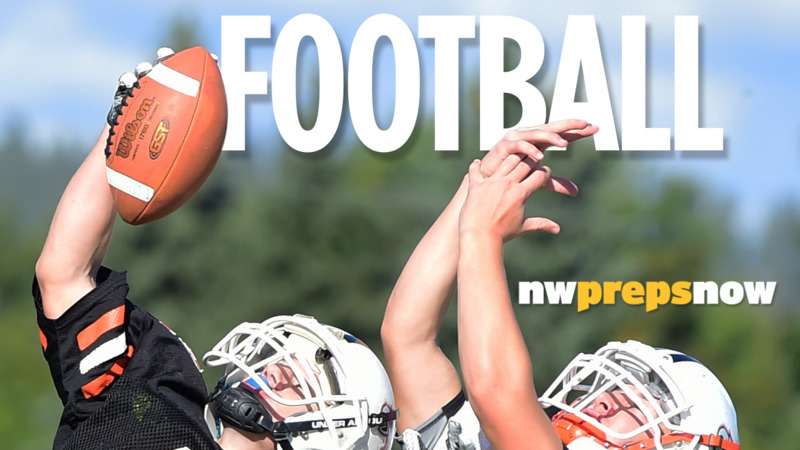 Northwest Christian 34, Lind-Ritzville/Sprague 13: Jake Gray threw for 165 yards with two touchdowns and the visiting Crusaders (2-0) defeated the Broncos (1-1). Tekoa-Rosalia 70, Northport 6: Noah Beach had two touchdowns and two 2-point conversions and the Timberwolves (1-1) defeated the visiting Mustangs (0-2) in a Northeast 1B league game. Entiat 60, Selkirk 28: The Tigers (2-0) scored 22 points in the first quarter and they defeated the visiting Selkirk Rangers (1-1). Clark Fork 42, Lakeside 8: Cameron Garcia rushed for 233 yards, accounting for five touchdowns, and the Wampus Cats (2-1) downed the visiting Knights (0-3) in a White Star league game. Colton 64, St. John-Endicott 6. Sandpoint 28, Raymond 21: Dillan Mitton ran 29 times for 142 yards with two touchdows and the Bulldogs (1-2) defeated the visiting Comets. Timberlake 42, Moscow 36: Joey Follini threw two long touchdown passes and added a pair of short scores on the ground and the visiting Tigers (2-1) roared back from a 22-point deficit to edge the Trojans. Derek Rauch-Edwards compiled 121 all-purpose yards and scored twice for the Tigers. Published: Sept. 7, 2018, 11:13 p.m.